What to call your book? It’s a dilemma that has many novelists, nonfiction authors and writers of children’s books gnashing their teeth. Others give their book title little thought, only to discover later that they’ve made a massive error. 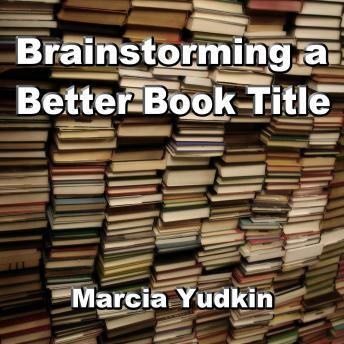 "Brainstorming a Better Book Title" gives you an effective title-finding process to follow. More than 150 analyzed examples make the stakes of this search very real. Discover how to avoid titles that could cause problems for your book and learn how to identify and select your best options. This short audio course helps whether you’re a literary, academic or commercial writer, whether you write fiction, nonfiction or something unclassifiable and whether you’re just starting your book, in the final stages or trying to repair a title mistake. Instructor Marcia Yudkin has more than 25 years of publishing experience, including several books with major New York publishers, self-published works, coaching of new academic, self-help and business authors, and more than a decade as an on-call editor for a small press. She now heads a naming firm, Named At Last, that helps entrepreneurs come up with appealing and appropriate names for companies, products and books. Order "Brainstorming a Better Book Title" now to get your book on track with an exciting, fitting title.